Sorry the site was down today, our host had some issues. I have a feeling “getting fired” in this place involves literally being set on fire. Which doesn’t mean much for her, but… those poor bats. Panel 3 & 5 Pamela=Gravatars? Skärva’s hair is his most glorious asset. He may have a shark face, and a permanent black eye, and have absolutely no meat on his bones, but he has WONDROUS HAIR, dangit. Are these “papers” going to be slabs of chiseled basalt? Or just enchanted with a ward against fire? She’s actually a MOLTEN ROCK spirit. Jeeeeez! And in an EXTREME and unbelievable case of irony, this dungeon is the one to actually defeat the hero, Blank, and end his reign of heroism and rescuing the princess, utterly eliminating him from the map. It turns out that he didn’t understand how to escape the lava via the movement commands, and just failed miserably every time he came across it. Skarva then proceeds to enter a case of depression as he realizes just how pathetic/sad this instance was. And then we have an entire comic that’s six panels of the exact same image of Skärva sitting in a dark corner with an expression of utter despondency on his face. The next comic: the same thing. My life will be so much easier. See? My madness occasionally produces helpful advise! That said, thank you very much for the comic, and I do not in any way mean to seem like I appreciate it any less with the poor jokes, it really is quite amusing, well written, the art style is enjoyable, and I’ve not seen the super-villain following theme ever done in this way before. So, once again, thanks. Aww, thank YOU for reading, and for the lovely comment. The comic is really hard for us two to maintain sometimes, but I never doubt that it’s worth it. Who is Pamela’a boss I wonder? Is it the end boss or some strange little hermit in a cave? Also if she was fired where would she go? Some Lurkin in a suit, I’m thinking. CEO of Molten Mountain. In addition to the dungeon, they run several volcanic island-themed tourist-trap restaurants scattered throughout Idenau. …She’d probably end up as a waitress at one of those. Or travel in the magma deep into the world’s core and pop out of some other volcano, starting a new life. Heck, that’s just what I would do anyway, if I were her! Maybe Pamela’s afraid of being all washed up?? 7,631 dowsth…. oh Captcha, the entertainment is endless. You never know when you’ll need extra dowsth. really. i think at least 1 droplet landed on one of them. is that a Idenau brand? Huh, I hadn’t noticed the “I” thing. That’s just the font – all the capital letters are just a tad bolder than the lowercase, I think. It makes her seem pretty self-centered. this would be a great time to mimic my .gif i made on deviant art. look but dont touch. you’ll burn. (captcha “side, ickupda”) is ickupda a type of food? sounds unpleasant. Well, if I remember right they just need to delay the hero, since the plan actually mostly rests on him talking to the hero eventually. Sure if Blank dies in one of the dungeons that’d be great too, but it’s not a necessity as long as they get the potion ready before he arrives at the main castle. If it was a matter of hiding something in the dungeon, what I’d do is get a magma proof box, put the item in it, and put it into one of the random pools of lava. 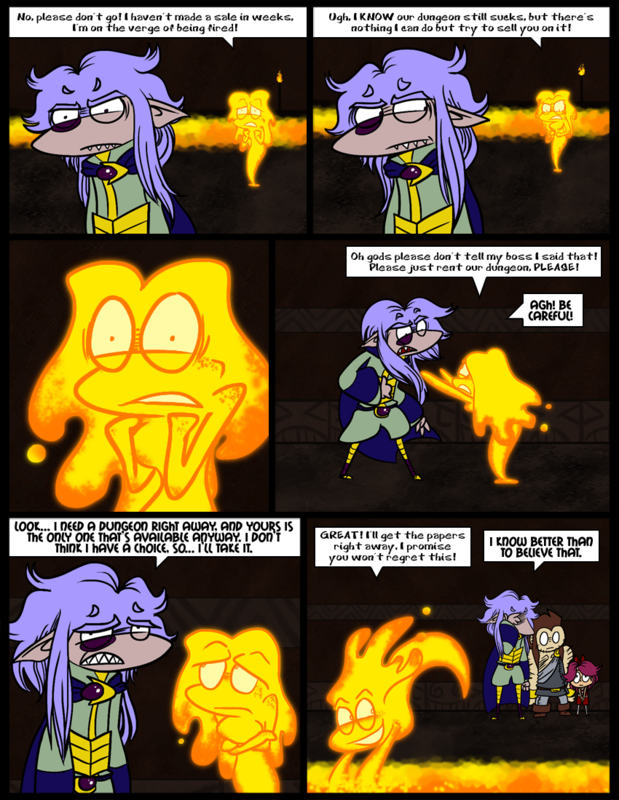 That way, even if Blank could somehow tell which pool of lava he had to get it from he’d be unable to obtain it, because of the platformer based ‘bounce’ effect the lava has in the dungeon. The lava in Idenau actually works like real-life lava should, and less like a lot of video games where it might as well be a mass of glowing nacho cheese. That is, despite being molten, it is still rock and very solid. In reality, a person could never “fall into” lava, they would just sit on top and fry to death. Hence the bouncing makes sense, and I even think a box would just sit there, although eventually getting carried away and covered up by lava currents I guess. But anyway THAT WOULD BE CHEATING. Even villains have their own code. Ahhh, finally caught up on all the strips after Ms Beaton of Kate linked me here a while back. Skärva is adorable and I wish to pinch his chee – I mean, not do anything at all that would be at all embarrassing to the great Skärva! Wait on, he’s a shark person, yes? Does he even HAVE cheeks? He really doesn’t have many pinchable areas, period He’s a stick. But he has at least a little bit of cheek, as you can see when he gets a little wrinkle at the side of his mouth. Hehe. Go ahead, he doesn’t bite – well, actually, maybe you shouldn’t. Thank you so much! :3 I guess we’ll never stop getting hits from Kate. It’s one of the best things that has happened to us. I am grateful for Victor’s obsessive twitter-watching! He could always try to go back to the Frozen one…maybe the penguin will have forgiven him by now.